It's the last week of November! This means not only the end of Thanksgiving and the official start of the Christmas season, but also that it is time for this month's round of Cucina Conversations (!!!) This month our theme is pane, or bread. I happen to be a big fan of making my own bread, as evidenced by this challah bread, these bagels, these maritozzi, this pizza bianca, and this focaccia. I've said it before and I've said it again -- bread making is more wait than work, a bit of mixing and kneading paired with lots of resting and rising from the dough. 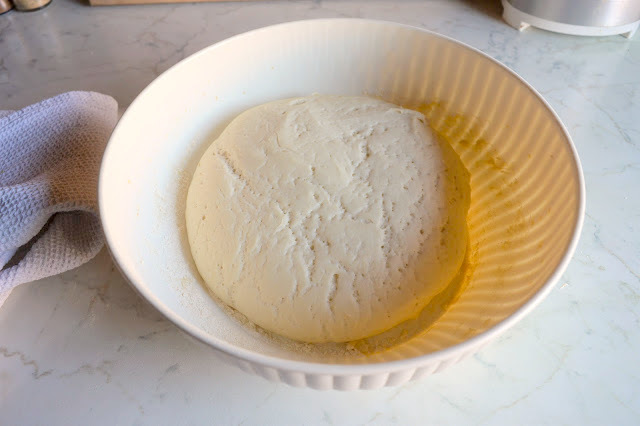 It's really not all that difficult, and the whole process is pretty cool to witness -- what starts out as a bit of flour, yeast, and water transforms into a dough that then doubles in size and then, with a little time in the oven, magically morphs in to a loaf of bread. And it gives you bragging rights among your friends, because you made your own bread. Quindi! 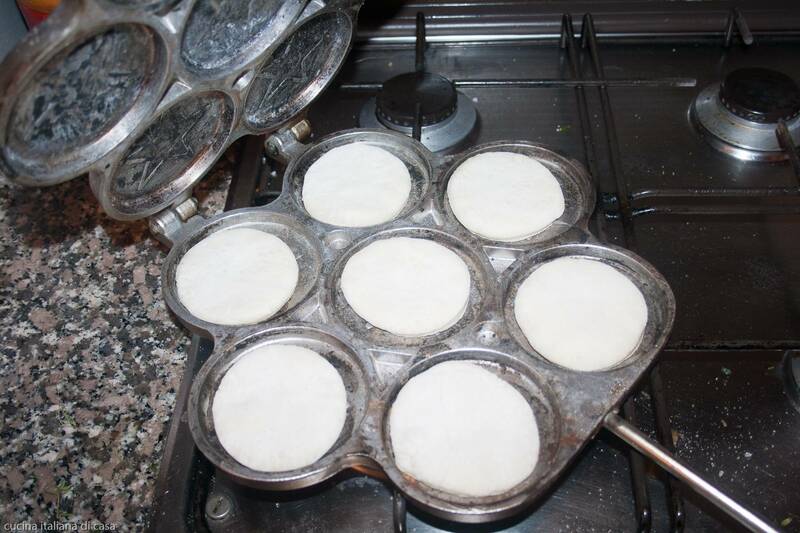 My selection for this month's theme are tigelle, small round breads typical of the Emilia-Romagna region, particularly the province of Modena but also common in Bologna, where I lived for a year. 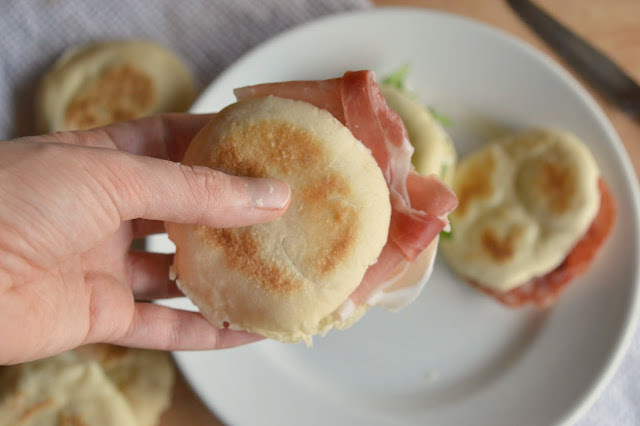 Tigelle are split and then stuffed with meat, cheeses, or vegetables, and are traditionally eaten as an antipasto. That being said, they can also easily be a full meal in their own right, which is exactly what I did when I lived in Bologna, with frequents visits to Tigelleria Tigellino, right near the city's main piazza. Fun fact: the name tigella comes from the tool that was traditionally used to shape and cook them, clay, fire-resistant discs called a tigelle, which were alternated and stacked with the uncooked dough to ultimately create a sort of tigelle tower that was placed by the fire and left to cook (you can see how it was done here). Now that we've mostly left cooking things by fire behind, there are more modern tigelle available, ones that are made from aluminum and placed over the stove (they look like this). My recipe research showed that there is no one way to make tigelle; some recipes called for doppio zero flour (a super fine, pure white flour) while others recommended all-purpose; some used milk as a liquid ingredient, while others advised cream, and still others a combination of both; a few recipes recommended cooking the tigelle in the oven, others on the stove in a pan, and some in the aforementioned modern day tigella. The common ingredient in all recipes appeared to be strutto (straightforward translation: pig fat, easily found in supermarkets here) but some recipes I stumbled across used a mix of oil and strutto or simply oil or butter, for those who might have qualms about using strutto. Hmm. In the end, I came up with this recipe -- 00 flour because it's what I had on hand, whole milk because strutto seemed heavy enough without adding cream, cooked on the stovetop -- all of which resulted in perfectly puffy, delicately golden brown tigelle, fluffy and soft on the inside and slightly crisper on the outside, the perfect vehicle for my chosen ingredients, or rather, salame piccante, prosciutto, stracchino cheese, and arugula. I ate the three you see photographed above for lunch, then maybe another two or so, before tucking the remaining ones into a bag to keep for, ehm, a midnight snack lunch the next day. I hope you do the same. 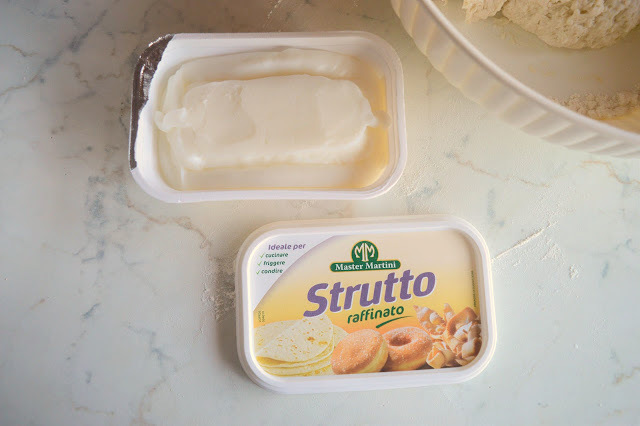 A couple of notes: Strutto is used widely in Italian cuisine, an ingredient in piadine from Bologna, seadas from Sardinia, and schiacciatine from Mantova, plus used in the frying of Sicilian cannoli. It is difficult to find in the U.S (I've tried!) and I'd guess also in other countries that aren't Italy. You can substitute butter or olive oil here with good results. 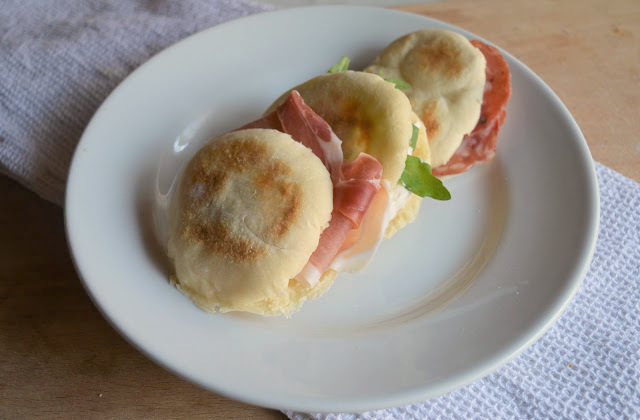 Tigelle can be filled with any kind of meat, cheese, or vegetables you'd like - prosciutto, stracchino, and arugula is my favorite. If you want to cook them in the oven, preheat the oven to 370 degrees Fahrenheit (200 degrees Celsius). Place the tigelle on a baking sheet and cook for about 10 minutes, turning them half way through the cooking time to ensure both sides are golden brown. Whether you use the oven or the stove, the tigelle should puff up (magical!) as they cook. 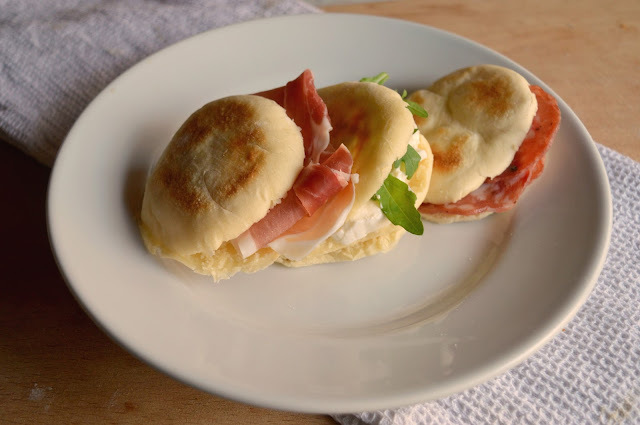 Daniela of La Dani Gourmet is sharing her recipe for focaccia ligure. Lisa aka Italian Kiwi has made focaccia di recco. 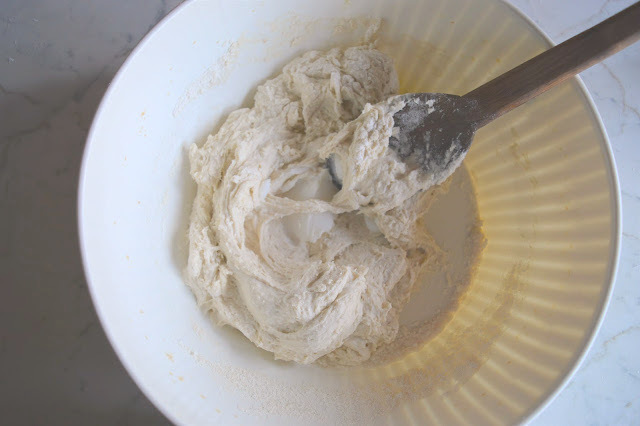 Last but not least, Carmen at The Heirloom Chronicles has made rosette di pane, a classic Roman bread. 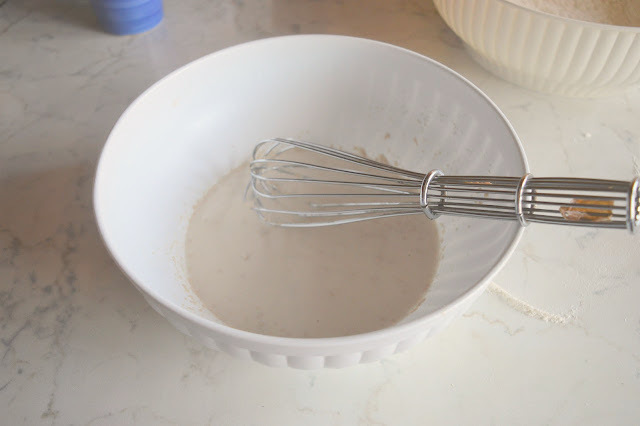 In a small bowl, dissolve the yeast in the water and milk, whisking everything together. 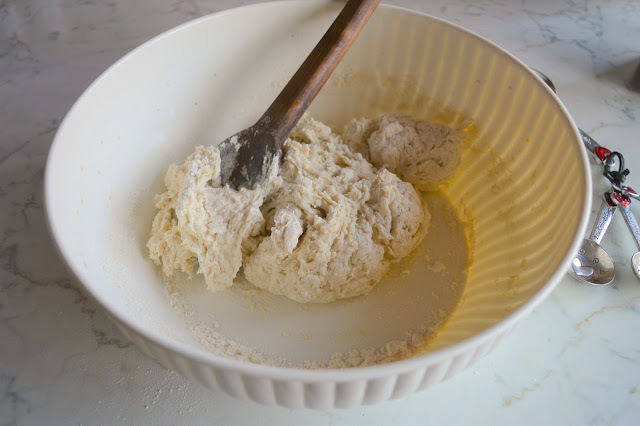 If you're doing this by hand: put the flour in another larger bowl, make a hole in the middle of the flour, and pour in the yeast-water-milk mixture. If you're doing this with a standing mixer, do the same exact thing as above, just in the bowl of the standing mixer. Next, mix everything together with a wooden spoon (or with the paddle attachment of your standing mixer). If the dough seems dry (it probably will) add more milk and water (a tablespoon of each) until the dough starts to come together. I think I ended up having to add about 1/3 cup more liquid. Add the strutto or olive oil/butter and salt, and mix together again. 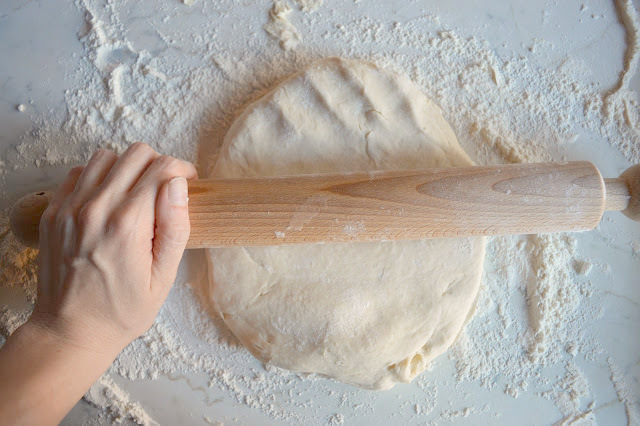 If you're doing this by hand, at this point, you should turn the dough that is starting to form out on to a lightly floured work surface and start to knead until the dough comes together. Knead for another 8-10 minutes or until a smooth elastic dough forms. If you're doing this with a standing mixer, you can knead the dough using the dough hook attachment (lucky you!) 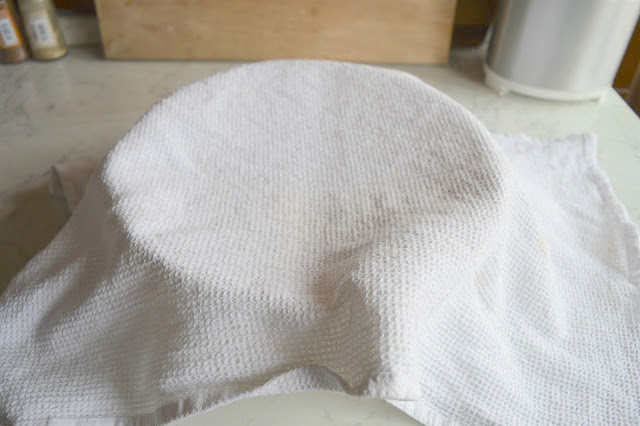 When you're done kneading, form the dough in to a ball, place it in a bowl covered with a kitchen cloth, and let it rise in a warm, dry place for 2 hours, or until it doubles in volume. 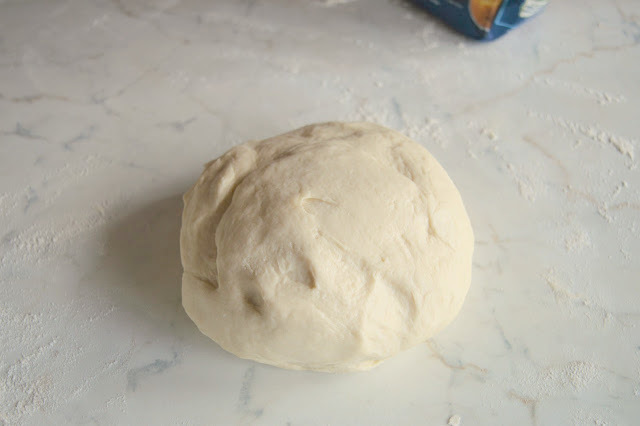 Once the two hours are up, place your ball of dough on a lightly floured work surface and with a rolling pin roll it out until very thin, about 1/2 a centimeter. 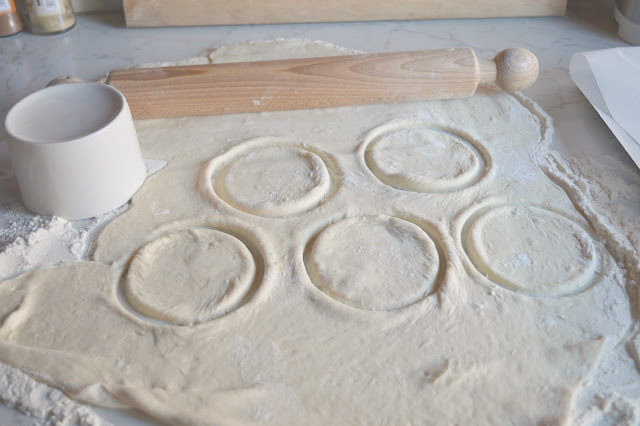 Using a 3-4 inch (8-10 cm) lightly floured cookie cutter, cut out as many tigelle as you can. Combine the scraps in to a ball, re roll the dough, and repeat until you have used all the dough. You should have 20-25 or so tigelle. Set the tigelle on baking sheet and let them rise for another 30 minutes. When the 30 minutes are up, you can start to cook your tigelle. If you want to cook them on the stove: heat a large skillet over medium heat and cook the tigelle, turning, until puffed and brown on both sides (this will take about 6 or so minutes). Let the tigelle cool, then slice them open, fill with ingredients of your choosing, and enjoy. Makes 20-25 tigelle. 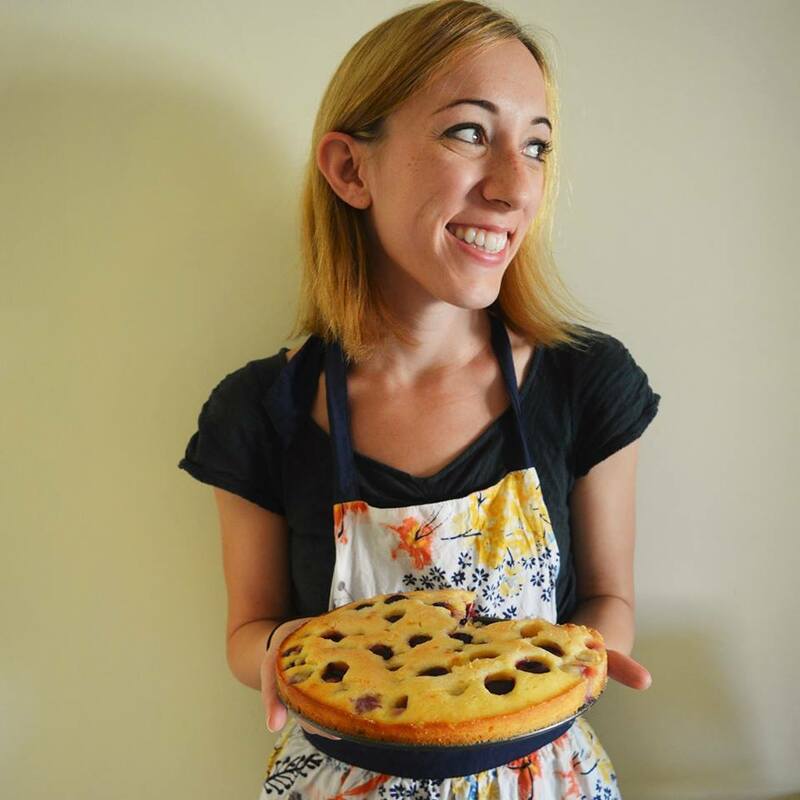 This will be my second year attending a Thanksgiving hosted by Emily O., one of my closest friends here in Rome who also happens to be one of my very favorite people to cook with (you may remember her from this post here). An invitation to Emily's for dinner is always a treat -- her greatest hits include a caramelized onion and goat cheese quiche, meatballs made with feta and dried apricots, pasta with a tomato, butter, and oregano sauce, and juicy all-American burgers with a side of ultra-addictive potato salad, not to mention dessert -- upside down plum cake, apple cheesecake bars, and a pear and red wine tart, to name just a few. Emily's culinary resume also includes tackling last year's turkey, a smashing, butter roasted, herb coated success big enough to serve 20+ people. With her, you can rest assured your taste buds are in good hands. Now! The invitation Emily sent out for Thanksgiving this year had a certain request on it, namely: let us know what you're bringing so we can plan the menu accordingly, but please, NO PASTA. While we have a lot of Italians coming to our Thanksgiving, and while its true pasta in Italy is an obvious choice, I see Emily's point; Thanksgiving is that one day a year where the table should be filled with traditional oddities like sweet potato marshmallow casserole, sweet and savory everything-but-the-kitchen-sink stuffing, a turkey of epic proportions, and a pie made with pumpkin. If you're organizing a Thanksgiving abroad, you will also want to give your non-American friends a chance to sample the Thanksgiving classics, all in the name of cultural exchange. Therefore, I repeat: NO PASTA ALLOWED. But there's a but (isn't there always?)! 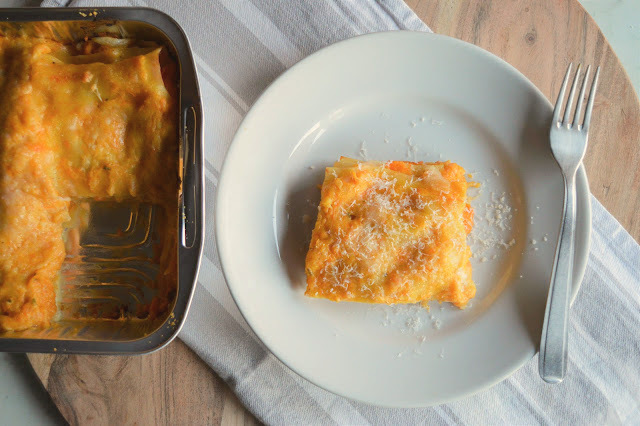 But what if one were to contribute not just your typical, tomato sauce/ragù filled lasagna, but one with a distinctly Thanksgiving twist, one filled with butternut squash, an undeniably Thanksgiving-y ingredient?! What if one were to to cook this squash in white wine with garlic and sage, layer it with pasta, Parmesan, mozzarella, and a velvety béchamel sauce, with a bit of prosciutto sprinkled in for good measure? Wouldn't this amount to an arguably Thanksgiving appropriate pasta dish (don't forget that squash!) one that would be so delicious one could overlook those few Italian (Parmesan, mozzarella, prosciutto, wine...) ingredients thrown in?! Yes, yes it would. 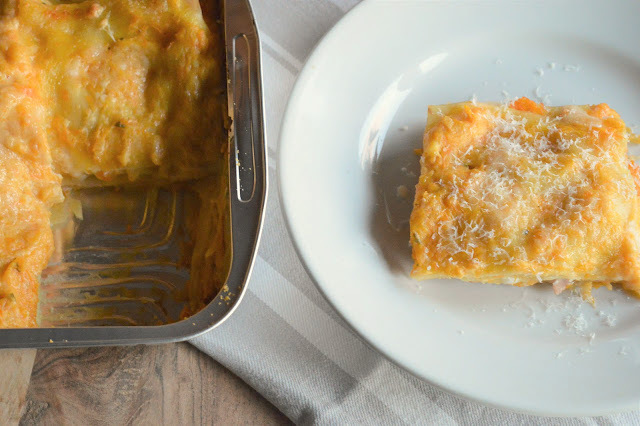 This butternut squash lasagne (lasagne alla zucca) was spectacular, one of those recipes that come out so well, I run to whoever's nearest (usually my sister) to tell them all about it, then proceed to bombard my foodie friends with photos and messages of the resulting dish (you know who you are). 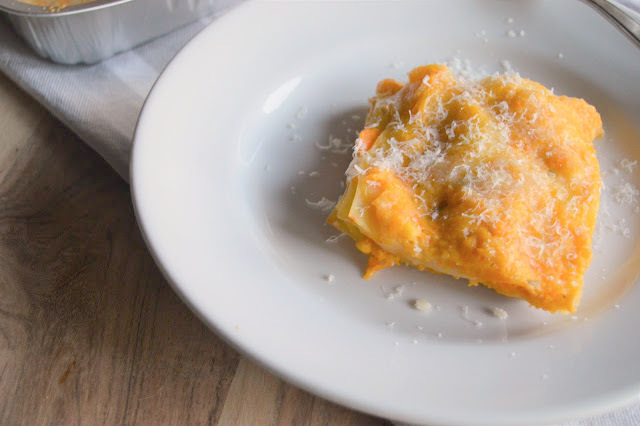 This lasagne was intensely yet not overwhelmingly squash-y with hints of sage and white wine, superbly cheesy, as a good lasagne should be, with a surprise bite of prosciutto every so often to keep things interesting. 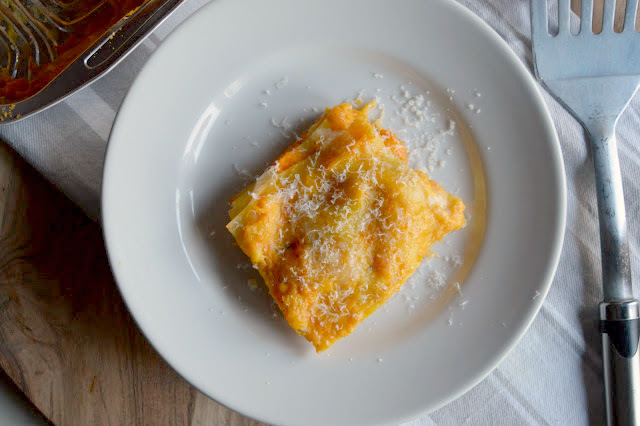 As the photos show, it was also a fiercely and un-apologetically fiery orange, to remind just in case you forgot that this is a butternut squash lasagna, not your typical lasagna, and therefore is fit for your Thanksgiving buffet in all its autumnal splendor. A couple of notes: This recipe is pretty flexible -- you can use another kind of cheese here in place of the mozzarella; provolone, scamorza, or fontina would be nice too. You could add a little nutmeg to the béchamel if you'd like, or leave out the prosciutto if you're feeding vegetarians, or add mushrooms (sauteed porcini mushrooms would be nice) to the layers. I like to buy my squash already cut in to cubes (thanks, Carrefour) but if you're buying a full squash, be sure to remove all the stringy insides and seeds and peel before chopping up and measuring out your 900 grams. If you don't have an immersion blender to puree the pumpkin, a blender or a food processor would probably work just as well; just give it a few pulses until the mixture is fairly smooth but not super liquid-y. Finally, I didn't put exact quantities for how much cheese, prosciutto, béchamel, pumpkin go in between the layers, but just use your judgement and eyeball it as you go, figuring you need to have about four layers with the fifth layer covered in pumpkin, béchamel, and more Parmesan. Looking for other cozy, layered recipes like this one? I've also got this lasagna alla Bolognese and this parmigiana di melanzane. For more pumpkin/squash recipes, I've got this pappardelle with squash and porcini mushrooms, and these savory squash pancakes with sage butter. When the squash begins to soften, add the wine and the water. Let the squash mixture cook until the liquid is completely absorbed, adding a little more water if some of the pieces of squash are still on the undercooked side. While your squash is cooking, get your béchamel started. In a medium pot over medium low heat, melt the butter, then sift in the flour, a little at a time (sifting isn't absolutely mandatory, but it helps lumps from forming in what should otherwise be a nice smooth béchamel sauce). Stir the flour and butter for a minute or two, then add in the milk a little at a time, whisking, until it is all incorporated. When your béchamel is done, turn off the heat it and set it aside. Your pumpkin should be fully softened by now. Remove the garlic clove and discard. Put the pumpkin in to a large bowl and mash down as best you can with a potato masher, if you have one, just to get you started. Next, use an immersion blender and blend the pumpkin until smooth. Taste the pumpkin mixture for salt and pepper and season if needed. Time to assemble! Take a 7x11x2 inch (28x18x5 cm) baking pan and butter it lightly (not sure if this is necessary but I always do this to make sure the bottom layer doesn't stick). Stir about 1/3 cup (about 5 tablespoons) of béchamel in to the pumpkin and set aside. Ladle a thin layer of béchamel over the bottom of the pan, then place three lasagna noodles on top. Next, spoon some pumpkin over the noodles, then a generous sprinkling of Parmesan, some mozzarella, a bit of prosciutto, and then another ladleful of béchamel. Repeat these layers with your next 9 noodles (to make 3 additional layers, with 3 noodles each), pressing down the noodles to compact everything with each layer. Top your fourth layer with three plain noodles. Whisk the remaining béchamel into the remaining pumpkin and pour over the last three noodles. Top with whatever Parmesan is left, plus a little more if you'd like (a nice Parmesan crust on top will form in the oven). 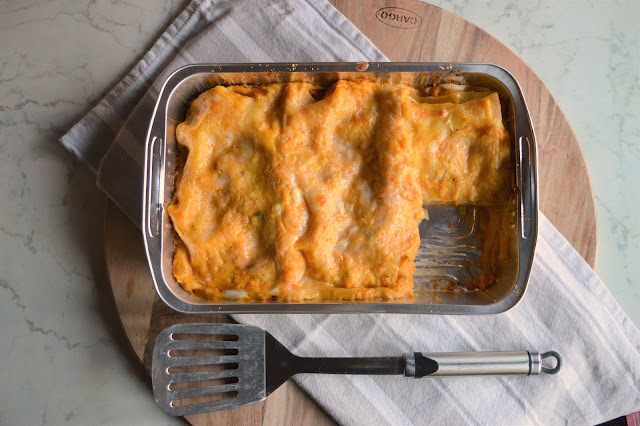 Cover the lasagna with aluminum foil and bake in the middle rack of the oven for 30 minutes. When the 30 minutes are up, move the lasagna to the higher rack in the oven, and bake for an additional 10 minutes, or until the Parmesan browns on top. Remove from the oven, let cool slightly, and serve immediately with extra Parm on the side if you'd like. Serves 6. What I'm about to write might shock and/or upset you, but here it goes: I'm an ardent non-fan of mashed potatoes. I know, I know! Saying you don't like mashed potatoes -- one of those foods-loved-by-all, up there with pizza and ice cream -- is like saying you don't like sunshine, or kittens, or a good night's sleep. While I don't hate mashed potatoes (that would be you, tripe) its not a side I'd ever seek out, or order, or crave. My allegiance lies instead with Roast Potatoes, because as far as I'm concerned, its a crime to boil and mash up potatoes if you can instead toss them with lots of olive oil and herbs and roast them until they're superbly crispy and golden brown and glorious. It is very possibly side dish heresy to say this, but -- I'd much rather see a pile of roast potatoes on the Thanksgiving table than a heap of mashed potatoes. Who's with me?! -Herb infused olive oil that the potatoes are roasted in, plus tossing the potatoes with extra herbs before serving makes these extra flavorful and rosemary-ish (rosemary + potatoes = soulmates). just you and a fork. I speak from experience. A couple of notes: I am not a huge fan of garlic, so I infused the oil with the cloves and then threw them away. If you like garlic, feel free to mince it finely and toss it with the potatoes at the end. Make sure all the potatoes roast in one even layer to ensure maximum crispiness. Lastly, my apologies for the slightly dark photos, but these were photographed on a rainy, cloudy day, which is actually just the sort of day one should be eating a big portion of super cozy comforting roast potatoes. Looking for other Thanksgiving sides? I've got these green beans with shallots and pancetta, these mashed potatoes, this stuffing with sausage, apples, and apricots, these savory squash pancakes with sage brown butter, this butternut squash and caramelized onion galette, these cornbread muffins with maple butter, or these herb roasted carrots. Adjust oven rack to center position and preheat oven to 450 degrees Fahrenheit (230 degrees Celsius). Heat 3 quarts (12 cups) water in a large pot over high heat until boiling. Add 2 tablespoons salt and the baking soda, then and the potatoes and stir. Return the water to a boil, reduce to a simmer, and cook until a knife meets little resistance when inserted into a potato chunk, about 10 minutes after returning to a boil. Meanwhile, combine the olive oil with the rosemary, garlic, and a few grinds of black pepper in a small saucepan. Heat the olive oil mixture over medium heat. Cook, stirring and shaking the pan constantly, until garlic just begins to turn golden, about 3 minutes. Immediately strain the oil through a fine-mesh strainer set in a large bowl. Set garlic/rosemary mixture aside and reserve separately. When the potatoes are cooked, drain them carefully and let them rest in the pot they were cooked in for about 30 seconds to allow excess moisture to evaporate. Transfer the potatoes to a bowl with the infused oil, season to taste with a little more salt and pepper, and toss to coat, shaking bowl roughly, until a thick layer of mashed potato–like paste has built up on the potato chunks. Transfer the potatoes to a large lightly oiled baking sheet and separate them, spreading them out evenly. Transfer to the potatoes to the oven and roast, without moving, for 20 minutes. Using a spatula turn the potatoes over. Continue roasting until potatoes are deep brown and crisp all over, turning and shaking them a few times during cooking, 30 to 40 minutes longer. Transfer potatoes to a large bowl and add garlic/rosemary mixture and minced parsley. Toss to coat and season with more salt and pepper and serve immediately. I've said it here and here and I'll say it again: my very, very, favorite dessert, holding the number one spot for yours truly for 14 years running is pecan pie. It's a fiercely American dessert -- I've never seen it in any other country -- and makes up the Thanksgiving pie "trinity" along with apple pie and pumpkin pie. That being said, pecan pie wasn't a turkey day tradition in my family; after all, its a dessert from the South, and as East coasters we had always stuck to apple or pumpkin pie and the stray brownie pie or two for dessert on the last Thursday of November. 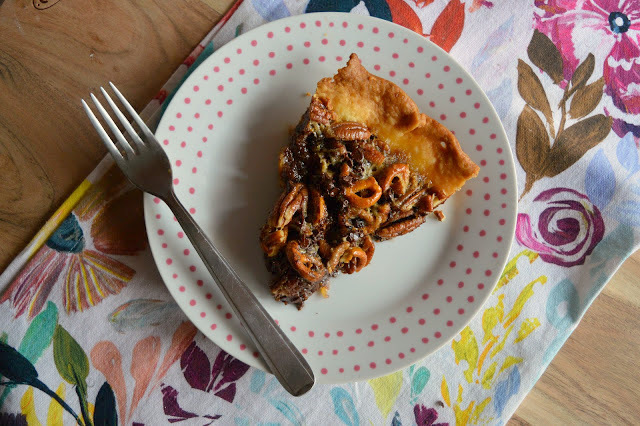 When I was new to baking back in the day I (wisely) decided to give pecan pie a try one year, and, well, it was love at first bite, dessert nirvana, one of the best things I'd ever tasted. On that day, November 27, 2003 pecan pie knocked carrot cake off its sugar dusted gold medal Favorite Dessert Podium and we've been together ever since. But pecan pie isn't perfect (who is?!) I mean, it is for me, but I can see where issues would come up: it is very sweet, and quite gooey and caramel-y (characteristics typical of American desserts). If you've been raised in any country other than the States, it might take a few bites to get used to. Today's Pecan Chocolate Pretzel Pie addresses these potential hangs ups, though; the pie's usual sugary sweetness is both tempered and countered with a handful of salty pretzels and heap of bittersweet chocolate, resulting in a pie that is downright addictive, crunchy and fudge-y and sweet and salty and chocolate-y all at once. 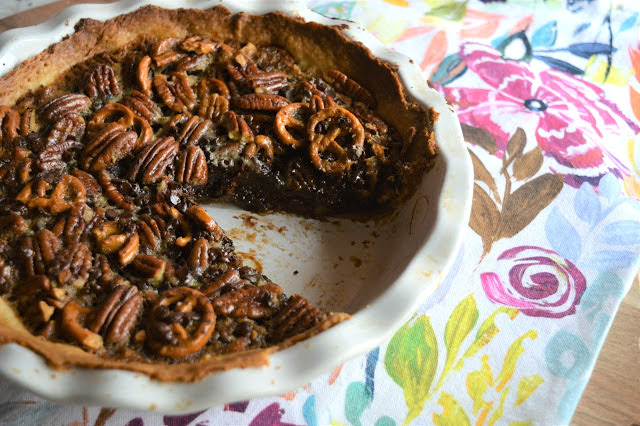 This is a pecan pie that makes all your pecan pie dreams come true, so good that you'll go easy on the turkey itself to leave room for a sizeable slice. Pumpkin pie who?? A couple of notes: For any of you in Rome who want to make pecan pie but can't find pecans: you can find them at the newly opened Isola delle Spezie in Via Marcantonio Bragadin 91(right near the Cipro subway stop and a convenient short walk from my apartment!) or some of the larger well-stocked Castroni stores. Castroni also sells both light and dark corn syrup. Note that the edges of the pie crust always brown faster than the filling cooks with pecan pie (and pumpkin too) so keep an eye on it; if it becomes brown and the filling isn't cooked, line the edges of the pie crust with aluminum foil to keep them from burning. I used a store bought pie crust to save time, but if you'd like to make your own, I've also used Smitten Kitchen's here with good results. Finally, I used mini chocolate chips here because that's all you can really find in Italian supermarkets, but feel free to use normal sized ones if you can find them where you are. 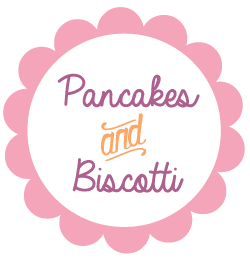 Looking for other pecan recipes? 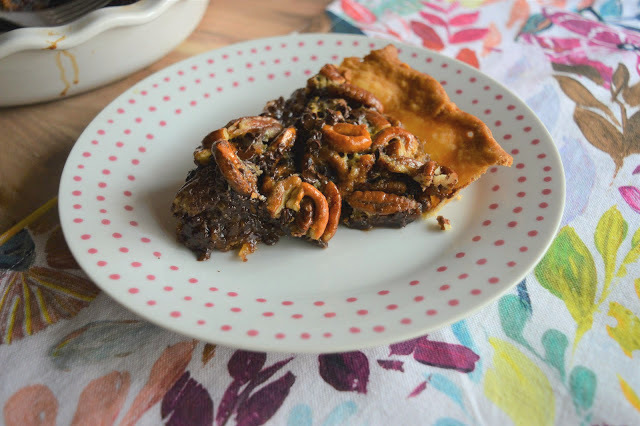 I've got this Chocolate Pecan Pie and these Pecan Pie Bars. Looking for other Thanksgiving worthy desserts? I've got this Pumpkin Pie, this Pear and Chocolate Tart, this Pear and Chocolate Cake, this Brownie Pie, this Pumpkin Gingerbread Cake, these Apple Crisps, this All-American Apple Pie, and this Pumpkin Cheesecake with Praline Sauce. Heat oven to 350 degrees Fahrenheit (170 degrees Celsius). Fit the pie crust into the bottom and up the sides of a buttered 9-inch pie plate. Trim any extra pie crust off. Refrigerate the pie crust while you prepare the filling. In a large bowl, whisk together the eggs, corn syrup, butter, vanilla, sugar, and salt. Stir in the pecans, pretzels, and chocolate chips. Pour the mixture into the prepared pie crust. Bake for 30 minutes. Cover the pie with foil and bake until the filling is puffed and the center is just set, 15 to 20 minutes more. Transfer the pie to a wire rack and let cool to room temperature before serving. Serves 8-10. Recipe adapted slightly from Women's Day Magazine, October 2017 issue.